The city has also failed to monitor the development at the Army Base as the Oakland Municipal Code and state law requires. In response to "requesting a copy of the Mitigation Monitoring Program form for the Oakland Army Base Redevelopment Plan (ER01035) that was returned to the Environmental Review Officer after the mitigation measures were implemented as required by OMC 17.158.340.F" the city responded: "Attached you will find the Mitigation Monitoring and Reporting Program for the Oakland Army Base Project (ER01035) updated in 2012 then revised and adopted by the Oakland City Council on July 16, 2013. This is the mitigation program applicable for the reuse of the former Oakland Army Base (OAB). The mitigation measures are being implemented, and monitored by the [c]ity, as the horizontal infrastructure (including the new roads, utilities and site preparation) is underway, and as the private development projects at the OAB (such as the new warehouses) are constructed. A mitigation monitoring compliance form is being developed, though it is still a draft. Please follow up with another request in about 60 days. Thank you." The municipal code states in part, "For a project for which a mitigated negative declaration or an EIR has been certified, at the time the project is approved, the mitigation measures will be compiled into a checklist form." In other words, the city has not prepared the checklist and monitored the development as state and city law require. And this is one of many projects where the city has failed to follow this section of the law. Speaking as a former writer for the Express, I can only say what a wonderful, iconoclastic and brilliant paper it was, and remains. I, of course, say this for, among other reasons, no matter how crazed or reasonable my story ideas were (letting journalists loose with Glocks, where the best places for outdoor nooky was, as well as encouraging me to write about the appearance of fake HIV drugs in the '90s). No matter how worthy or unworthy my writing, editor Linnea Due, with all due patience, would turn my words into gold. I can say without a doubt working with the Express crew, pre New Times, was the best experience a writer could have. Gift, spirited, nutso and determined were the watchwords. The late 1980s and Express brought long slice of life stories about working at the sewage works or other underrated jobs a level of dignity and interest I rarely see. 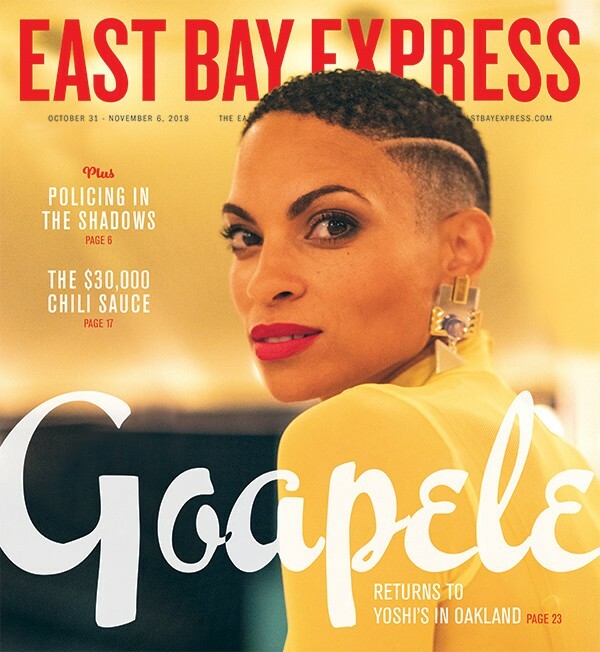 The Express of that was, and still is, all about the East Bay in its weird and wonderful glory. Getting to know and work with Kara Platoni, a brilliant, funny and utter goofball, and Chris Thompson who really should have be a detective noire hero made visiting the EBX offices a pleasure. And then to have it survive and even sort of thrive under New Times and come out the other side alive and kicking is something few papers have managed. If this sounds like a love letter it is. The Express deserves every dot, iota, and ounce of praise it gets. Thank you. Our Oct. 24 food news story, "Tilden Cafe Benefits the Community," erroneously stated that Debbie Call is an instructor at California School for the Deaf. She is retired. The story also should have stated that Tilden Cafe is partnering with Food Truck Mafia and hopes to work with Off the Grid. Our Oct. 17 election story, "A New Berkeley Council?" misstated when District 1 candidate Rashi Kersarwani went to work for the city of San Francisco. It was 2016, not 2017. Also, the story erroneously stated that District 7 candidate Rigel Robinson was still a UC Berkeley student — an error repeated in our endorsement guide. He graduated in May. Our Oct. 17 music story, "Blockchain Music Festival Comes to Berkeley," erroneously stated that Our Music Festival used Ethereum cryptocurrency. It's actually Stella Lumens. Our Oct. 17 music story, "The Acharis' Dark Inward Journey," erroneously stated that Cranes Records would be setting up the Acharis with a new producer. It is not. It also mistakenly stated that Wagner used to play in the band Starscape. The band was Starskate. Our Oct. 10 news story, "Battling Poison," misstated the location of Planting Justice. It's in East Oakland, not West Oakland. Also, the story erroneously stated that Alameda County had ended its use of Roundup. The county is reviewing its practices.